what time is it what time is it? Please submit stuff to the right folder. As she drank from a small, plain, wine glass, the last bit of red she had left from the cranberry juice cocktail she had “borrowed” from Princess Bubblegum’s Castle, Marceline floated, melancholy, above her red, stiff, couch and turned on the television to replay Finn and Jake’s Action/Adventure-Romantic/Comedy Movie they had let her keep. 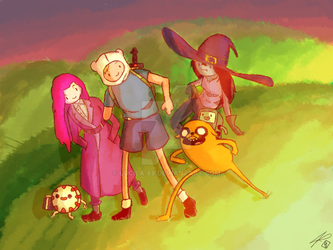 The dorkiness of Finn and Jake amused her and she spared one last smile for the night. Though, her smile didn’t last very long. In that ephemeral moment, the entire time, she thought of nothing else but how stupid she had become for dating an even stupider being; Ash. She thought of how idiotic she had been for falling for his spells and tricks, and believing they had shared the same love before. Spring Flurries - Chapter 5Such a quiet night. Not even the faintest hush of a cloud being pushed across the horizon. The moon hovered in the center of the sky, watching the scurrying creatures of the night, unblinking. The silence wasn't even perturbed by the usual drone of Fionna's snoring, completely absent tonight. The girl was sleeping one of the soundest sleeps she'd had in weeks, truth be told. She was curled up like a baby within her sleeping bag, a puddle of saliva building up beside her slack lips. The setting couldn't have been more still. Time didn't even seem to flow. Without any noticeable occurrences to measure it by, time may as well not have even existed at all. Nothing but soundless stillness, the lack of anything to disturb a picture perfect moment. "Princess! Marceline! We're back!" Finn yelled out happily as he and Jake walked through their front door and escorted the Water Nymph Princess up to their living room. "And we saved the Water Nymph Princess too!" Jake exclaimed happily, walking up the ladder after the Water Nymph Princess. "Great job you guys! Thank you for saving the princess from the Ice King's creepy clutches," said Princess Bubblegum happily. "He's not creepy Bonni. He's sweet, and handsome," the Water Nymph Princess said sadly, keeping her head bowed low. "Yeah right, you're so half-baked!" 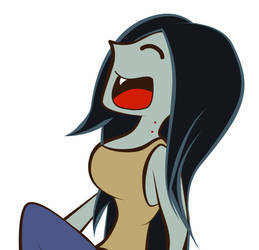 Marceline said, crossing her arms across her chest with an annoyed look on her face. "No, I'm not Marcy. I've finally found someone to love, why can't you see that sis?" asked the Water Nymph Princess, still refusing to raise her head up to look at anyone. Wholly cow, i knew fionna and cake was gonna get a buncha watchers by the millions but JEEZ!! i found this on my tumblr posted by Frederator. Read it up. Cartoon Network’s Monday night (Sept. 5) presentation of an all-new episode of original animated series ADVENTURE TIME (8 p.m.), currently in its third season, scored its highest delivery among all targeted kids and boys demos – ages 2-11, 6-11 and 9-14 – in the history of the series, earning double-digit growth across all audiences, according to Nielsen Media Research. The Labor Day presentation out-paced all competition to rank as the #1 program of the day on all television among kids 6-11 and 9-14, as well as boys 2-11, 6-11 and 9-14. Additionally, the strength of ADVENTURE TIME’S record-setting performance – which attracted more than 3.3 million viewers 2+ – helped propel the network’s Monday night all-comedy line-up (7-9 p.m.) to its best performance 2011-to-date among total viewers. Propelled by ADVENTURE TIME’s episode premiere, Cartoon Network’s overall Monday early evening (7-9 p.m.) also scored its best performance of the year to date. With strong performances from additional original animated series The Amazing World of Gumball (7:30 p.m.), Regular Show (8:15 p.m.) and MAD (8:30, 8:45 p.m.), Monday night grew significantly across the board – kids 6-11 average delivery (981,000) increased by 9% and ratings (4.0) by 11%, kids 2-11 delivery (1,307,000) increased by 8% and ratings (3.2) by 10%, kids 9-14 delivery (791,000) and ratings (3.3) both increased by 27%, boys 6-11 delivery (756,000) increased by 16% and ratings (6.0) by 15%, boys 2-11 delivery (958,000) increased by 14% and ratings (4.6) by 18%, and boys 9-14 delivery (595,000) increased by 36% and ratings (4.9) by 40%. 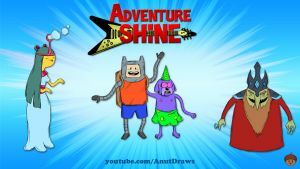 Adventure Time introduces viewers to unlikely heroes Finn and Jake, buddies who traverse the mystical Land of Ooo and encounter its colorful inhabitants. The best of friends, our heroes always find themselves in the middle of heart-pounding escapades. Finn, a silly boy with an awesome hat and Jake, a brassy dog with a big kind heart, depend on each other through thick and thin. Adventure Time with Finn & Jake originated from the mind of creator Pendleton Ward, and is produced in partnership with Frederator Studios, with Fred Seibert serving as an executive producer on the series. Cartoon Network (CartoonNetwork.com), currently seen in more than 99 million U.S. homes and 168 countries around the world, is Turner Broadcasting System, Inc.’s ad-supported cable service now available in HD offering the best in original, acquired and classic entertainment for youth and families. Nightly from 9 p.m. to 6 a.m. (ET, PT), Cartoon Network shares its channel space with Adult Swim, a late-night destination showcasing original and acquired animated and live-action comedy programming for young adults 18-34. NOTES: All ratings based on Total U.S. Television Universe of 114,500,000 homes. Hi, i wanted to share this with you people, I made it for a challange with my GF. Is this group dead or something? All of my submissions just expire and every time I try to ask questions, no response. WHY IS IT TAKING SO LONG TO ACCEPT ME? Pffff , My DA Its Sooo Boring ! Can Somebody Make it Fun ? !